As many of you know, our son Kei had a catastrophic accident in February 2011. Since then, Kei spent 15 days in intensive care and over 110 days in the hospital and rehab. Kei is now coming home to his family, and to new challenges. Kei’s returning home is a significant milestone. However, Kei remains confined to a wheel chair – for now. He also needs to get used to tackling the tasks of daily living, things he used to do without thinking. Kei has been working hard in physical and occupational therapy every day. He is planning to continue doing as much rehab as possible over the summer. He hopes to go back to school this fall, to be able to stand up and to walk again. One day he hopes to get back to the tennis court. His Varsity Tennis teammates from Fordham University and Darien High School know he has the strength and positive outlook to face these daunting challenges. There are many physical therapy and rehabilitation programs that are available to spinal cord injury victims like Kei, to help them regain their independence and to walk again. These programs are extremely costly and beyond the coverage provided by private medical insurance and government programs. Kei also faces the overwhelming daily cost of healthcare, medications and 24/7 home care assistance, as well as the expense of modifying our home to accommodate his special needs, rehab equipment, a power-assisted wheelchair, and special transportation to Fordham. We need help for Kei. To help with these expenses, a fundraising campaign in Kei’s honor has been established through HelpHOPELive, the leader in fund-raising assistance to support transplant and catastrophic injury patients (www.helphopelive.org). Contributions are tax-deductible, qualify for corporate matching gifts, and are administered by HelpHOPELive for Kei’s injury-related expenses. Contributions made to HelpHOPELive, with notation ‘in honor of Kei Usami’, are placed into a “restricted regional fund” which can only be used for Kei’s medical/rehab/vehicular needs that are not covered by medical insurance and government supports. Kei will have access to the names and addresses of contributors unless donations are made anonymously. He will not know the amounts of each donation. 96% of each contribution benefits Kei’s fundraising campaign (93% of credit card donations). The 4%-7% is used to offset fundraising supplies and administrative expenses at HelpHOPELive. For credit card contributions, please call 800-642-8399 or select the above DONATE NOW button. Together we can make a difference for Kei’s future as he faces this challenging time. We are grateful for the kindness and emotional support you have shown us. Many friends and relatives have already offered generous financial support. We cannot fully convey our gratitude for your financial contribution to help Kei, so that he can return to school, walk and play tennis and achieve everything he dreamed of before his accident. We did not update Kei’s progress for the past couple of years. Please accept our apology. Kei has been getting stronger than before. He goes to some rehab and some wheelchair tennis lessons, working for sport gear trading corporation and using his English and Japanese bilingual skill sets. Kei’s challenge continues while his parents are getting aged and older. Your continuous help and support for Kei will be greatly appreciated. Kei has been getting strong enough to take care of himself better than before. He started challenging a wheelchair tennis about two years ago. His college varsity tennis team member experience helped him to catch up with his wheelchair tennis. He would like to challenge against Mr. David Wagner, World No.1 champion some time in future. Got back from California Rehabilitation Trip! Saw some improvements and we are hoping this will continue more in 2014! A lot of big things to expect in 2014! Kei will be flying out to California for rehabilitation! Please wish him luck!! This past Saturday on the 18th of May, Kei was able to graduate from Fordham University’s Gabelli School of Business. It has been a very long and tough road for Kei to get to this point since the injury back in February 2011. When his name was called up by his Dean to receive his diploma, he wheeled up the ramp by himself pushing strongly one push at a time. Once he received his diploma, Kei hugged his Dean for about a minute or two and then faced his colleagues who were sitting in the crowd and raised his diploma with a huge smile on his face. When the diploma was up in the air, entire of Class of 2013 stood up and gave him a standing ovation. It looked like a scene from a movie. Usually, Kei is always smiling and laughing but once the graduation was over, he got very emotional and started to burst in tears. Those tears came from bottom of his heart and he felt that his hard work at school even in the wheel chair has finally come to an end with a great ending. He couldn’t stop crying even when he hugged his best friends and their families. Kei’s college journey may be over now but his way to get back on his feet to walk again has just started. Please continue to support Kei and his family by donating even the slightest bit so Kei can attend spinal cord injury facilities and one day get back on his feet again. Kei ended his 2012 in a very strong note. He finished up his first semester of his senior year at school and he now looking forward to the graduation in the spring. Kei went to Project Walk 3 times in 2012 (Spring, Summer, Winter) with the help from all of the people who supported and donated. He gained a lot of recovery in his upper body and his lowers are coming a long as well. Kei will continue to work even harder in 2013 than he did in 2012. Because he knows that ultimate goal is around the corner. Please continue to support Kei!! 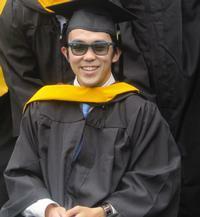 Thanks to your help and support, Kei compelted his junior year at Fordham University. He also completed two additional classes at UConn to earn credits for transfer to Fordham for the purpose of catching up with his Class of 2013. During his junior year, he stayed focus on not only academic accomplishment but also physical therapy and physical strengthening. In addition, he started going to the nearest gym to train and strengthen his upper body muscles. Not only you all but also Kei encourage us to work harder for Kei. He is determined and his spirit is amazingly strong, never having shown us any weakness and any tears. Such strong attitudes often make us cry behind the scene. He is heading for Project Walk again from July 15, 2012, hoping he will get recovered and get some miracle. We will keep you posted of his progress. Please see the News and Photos in this web page as we post how he is working there. Junior Year is over very healthy and successful. Kei continued taking two additional classes at UConn Stamford Campus every Tuesday and Thursday even after the school year at Fordham. He would like to catch up with his Class of 2013. Please cheer him up and give him a big applaude for his accomplishment in his junior year. Last week Kei participated in Project Walk, thanks to your help and support for Kei. It was a 5-day intensive program in which Kei received a three-hour training each day. They focus on how to help clients to stand up and walk more than help them to live independently on a wheel chair. They tested Kei on the first day and found out which muscles are strong enough to do certain training and not yet strong enough to do so. Shortly after the initial check-ups, Kei was provided with several training as you see in the pictures below. Kei repeated squats with his hands on the bar and his knees well protected by his trainer. 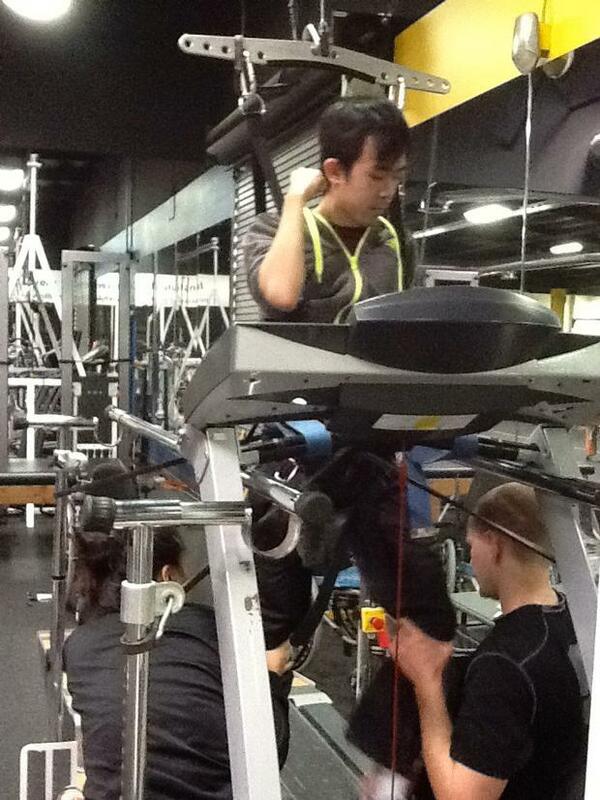 He was hang up and let his feet on the walking machine with each foot being moved by two trainers from both ends. 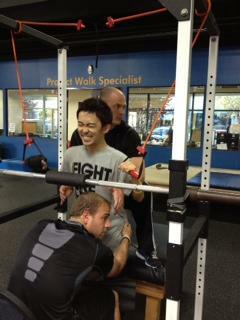 Kei is determined to continue training with Project Walk. As soon as he schedules his classes for this summer and next school year starting in September 2012, he is ready and willing to go back to Project Walk and gain his functions back. We need your continuous support for Kei so that he can continuous participating in this Project Walk program and recover his functions as quickly as possible. Thank you very much again for your thoughtful and warm support for Kei and our family. During this winter break, Kei has been taking rehabilitation and therapy at Norwalk Hospital Outpatient Unit, twice or three times a week and is planning to go back to school next week, January 17 (Tue). Kei did a very great job for the first semester, although it was quite a challenge in commuting between school and home, getting back to the reality, catching up with academic subjects and with his friends. School was kind enough to accommodate his needs. Kei has been fortunate enough to be helped and supported by many friends and family as well as doctors and therapists. Thank you all very much for your continuous support and cheer-ups. Kei has been googling the Internet and found “Project Walk” for spinal cord injury patients. He would like to participate in the program this coming March as he does not want to stay confined to a wheel chair for the rest of his life; he does want to stand up and walk again, and furthermore play tennis as an athlete again. Looking at his fighting spirit and his positive mind, I am sure something miracle will soon happen to Kei. Please pray for his successful recovery and continue supporting him. This year 2012 will be much better for you and for Kei than 2011. Since Kei returned home on 6/24/2011, time has passed very quickly. In about 2 weeks school will start. Kei has continued taking rehab and therapy at Hospital for Special Care located in New Britain, CT and there are 4 to 5 sessions remaining before school starts. His left-side hand has regained functions and can grab a cup or a tennis racquet while his right-side hand is not yet recovered as he wishes. However, Kei has learned how to type with his limited fingers and started communication with his friends and family, thanks to iPad as well as iPhone. The other day Kei went out to Darien High School tennis court and hit tennis balls with his left-side hand and arm. He loves tennis and hopes he will go back to Fordham Varsity Tennis Team in future. During the rest of his summer season before school, he is planning to visit several rehab facilities he can go to while he goes to school. He is highly motivated to rehab and therapy, believing that he will be able to stand up and walk some day in future. Kei’s challenges continue, as we all are hoping there will be something better tomorrow than today. Appreciating your continuous cheer-ups and support for Kei. Dear Usami Family, (Looks like this site does not support Japanese...So, I'm writing again) We are shocked to hear what happened to Kei-kun. Having a son of similar age ourselves, we empathize with you totally. How has he doing lately? Did he go back to school? We are confident that Kei-kun can overcome this challenge of his life. We are pray for Kei-kun for his quick and smooth recovery. Hi Kei, This is Mrs. Trifone I am so sorry about your accident but I do know you have such a positive "can do " attitude. I would love my swim team to fund raise for your cause. I remember you as such a role model, kind, enthusiastic and passionate about life! Let me know if there is anything I can do to help and if you need therapy in the water I would love to help you there.